Senzo Njabulo Shabangu I came to Johannesburg with a dream to become a pilot. I spent close to six months looking for academies. Ai I think it was really tough because I applied for bursaries as my father couldn’t afford to pay for the course because it’s very very expensive. 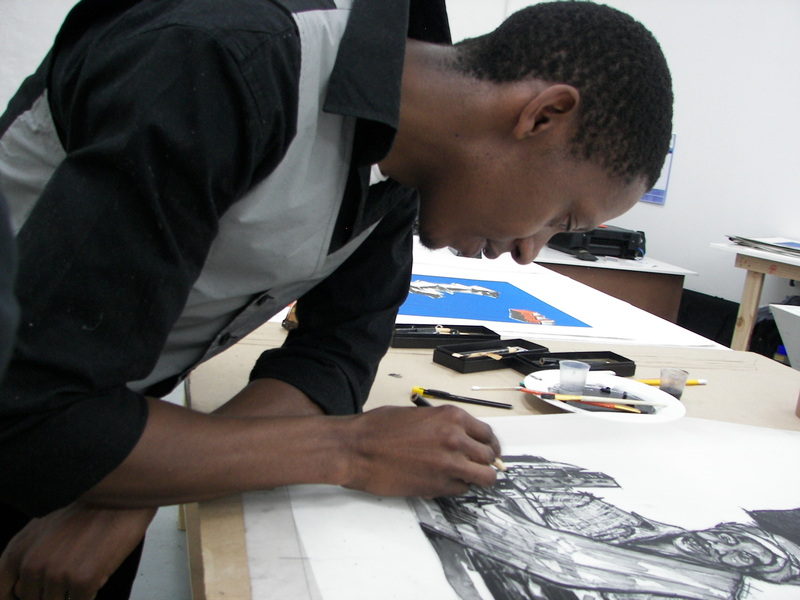 So I was in Johannesburg for six months up until my older brother and Robben Smith, the owner of the house in Kensington, one day asked me why I don’t look for an art school since I drew every day instead of wasting my time to become a pilot. Mmutle AK. So now, here we are moving into a situation whereby you are actually coming into contact with art formally. Senzo. …pursue art, Yes, it was like they just opened up something for me. The following day they advise me to walk around Newtown and check Art Schools en go to UJ (University of Johannesburg) to check if I can apply for a fine art qualification. I woke up, came to town, went to Newtown. But before I found my way to Newtown I had to start at Carlton Center. At Carlton I met a group of artists by chance drawing in the open space. They also had an exhibition as well. I spoke to them about my interest in an art career and they told me that there were some art classes offered by the Johannesburg Art Gallery on Fridays and Thursdays. I went there to enquire, but it was easy, the moment you arrive there they just said ‘sit down’ and gave you paper to start drawing…. Mmutle Arthur Kgokong: Well I just want to thank you Senzo for giving me the time to talk to you especially here in the studio, not at your home where you will be bombarded with house chores (jokingly). Mmutle AK: Yah, here it’s much better because it is your work space. Mmutle: At the moment you are here at The Bag Factory neh? MAK: You are working on a new body of work? Tell me what is the work about actually in terms of the content of what you are dealing with for this new body of work? Senzo. It’s like, I have been dealing a lot with issues of Joburg pressure because to me it is easy to realize that pressure the city has. So since I came here (in) 2006 I have been feeling that pressure like …at home when you are in the city they have their own expectations and as an artist it is also difficult. It is difficult for everyone the way a city designed because it’s got that pressure and for me as someone who comes outside of the city it’s easy for me to feel that pressure. Ï spent part of today’s morning at the Bag Factory, LL Editions Fine Arts Printmaking Studio in Newtown, Johannesburg, interviewing Senzo Njabulo Shabangu. He is currently working on a new body of work for an upcoming exhibition next year in September. ‘The exhibition is both here and in New York. I have decided to work in different spaces in order to broaden my horizon as an artist’ he states as he looks around him. 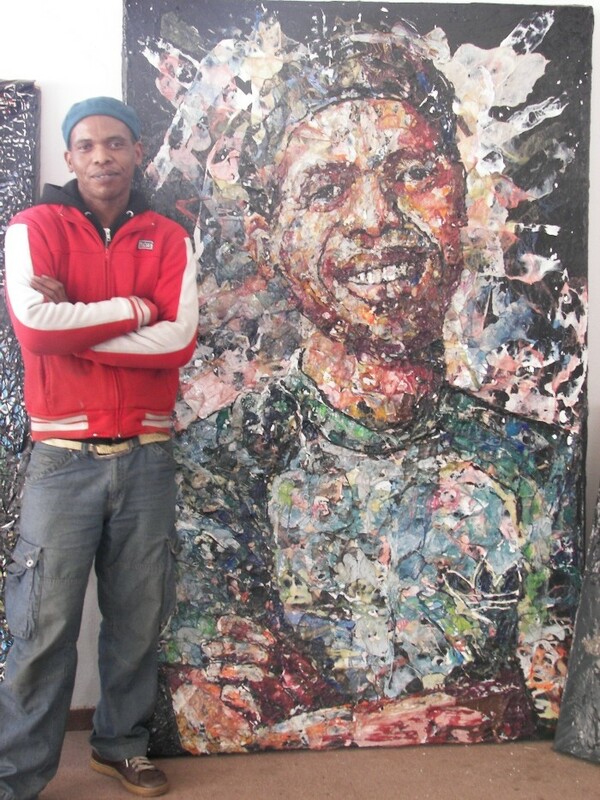 His studio is in Jan Smuts Avenue at David Krut Print Workshop. It is always such an honor to be afforded the opportunity to be immersed in the life of an artist. The next step is to make the interview accessible to you. This means the wordathonian chuchu train will be churning away behind the wordmachiniacon over the next weeks. 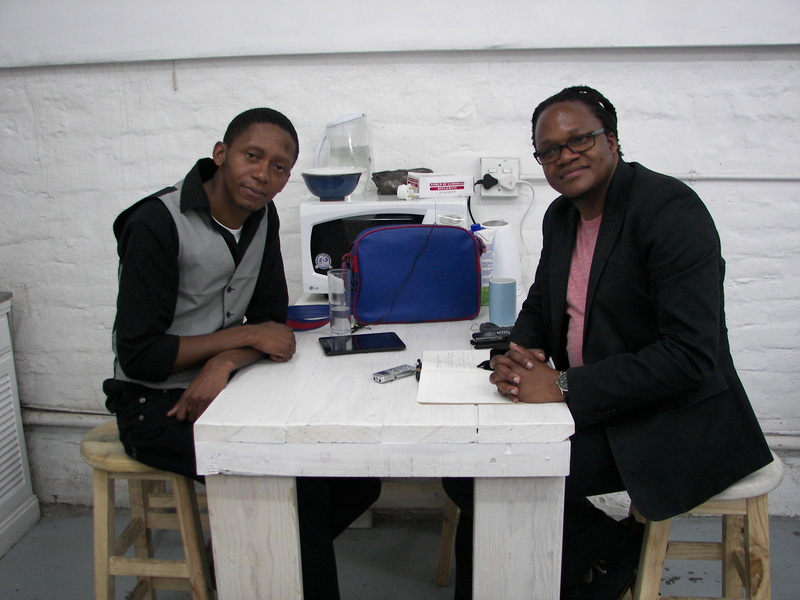 If there is anything that emerged from my interview with Senzo was a sneak behind the vanishing corner of what theoretically his work could be about; Although I cannot speak with authority at the moment, but what emerged was an interrogation of the dwelling space, the apartment, the urban flatlands, as a contested space between those who rent and those who lease. I hope that later on, your reading of the interview will help us make headway either towards affirming this theoretical perspective or its refutation.